Visiting Info: Open year-round, Grounds: 8am - dusk, Interpretive Center: varies by season, Free admission with suggested donation of $2 - $15. More than 1,000 years ago, a city of about 15,000 indigenous people rose up above the central plains near the Mississippi River. With over six square miles of mounds and temples, agricultural fields and homes, it was an urban hub of the vast trading network of the Mississippian people that lived on this land before European contact. Archaeologists and historians call it Cahokia, and it was probably the largest and most influential Mississippian community. Today it is the most complex archaeological site north of the much more famous remains of the pre-Columbian empires of Mexico. 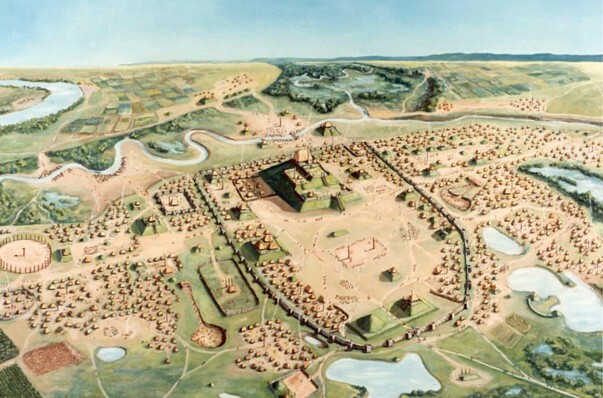 The Cahokia Mounds State Historic Site, located just to the east of St. Louis, contains 80 of the more than 120 original mounds, a central plaza for ceremonies and games, a reconstructed woodhenge, remains of stockades and palisades, and a copper workshop. The Interpretive Center displays artifacts, an introductory video presentation, and a recreation of the original village. Exhibits aim to educate the public about the Mississippian culture and the archaeological work that is going on at the site. Guided and self-guided tours of the mounds and trails are available. National Geographic web article May 19, 2015, "New Evidence May Solve Mystery of America's Huge Ancient City."